The 40 kilowatt-hour battery pack, and the 150 mile electric driving range it gives the KAR, is much more than is typical for electric cars, putting the KAR on equal footing with the low end of the Tesla Model S line-up. KleenSpeed claims it has "Outstanding Volumetric & Gravimetric Energy Density" which is a fancy way of saying the battery pack has a very high energy density on both size and weight. The battery pack also includes a thermal management system. To top it off, KleenSpeed claims their "unique business model projects bringing the KAR to market in mass production at a target price of only $9,995 MSRP." That business model separates the cost of the KAR and the cost of the battery pack. The KAR purchaser is buying the vehicle, and is leasing the battery pack. This lowers the up-front purchase price of the KAR, while giving the KAR owner an on-going lease payment. The battery pack lease is partly offset by "second life options," suggesting KleenSpeed intends to provide used battery packs for energy storage applications. 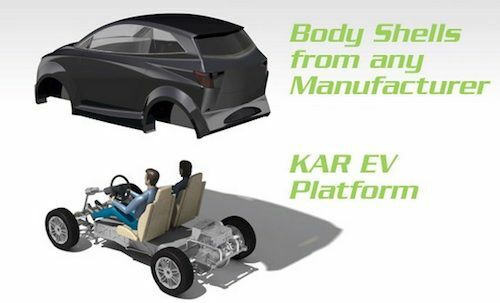 The KAR GT prototype KleenSpeed plans to reveal at the San Francisco International AUTO SHOW is described as their "vision of the automobile that will revolutionize the acceptance and commercial viability of the electric vehicle" and that it "is the first EV to really meet the needs of the world market at an affordable price point." Solid idea, but I think crash testing will be a problem. They could do like Rick Woodbury did for his Tango at Commuter Car, use a Nascar cabin frame :) Boy was that EV a blast and with lead batteries!